The Houston Rockets need Chris Paul. The offense slows and stumbles when James Harden sits. The defense misses the versatility of a healthy Luc Richard Mbah a Moute. Houston's rotation is very strong, but after the top eight players, they have little depth. We learned a lot from this game, most notably that we already knew everything we just learned. We had a month of games without Chris Paul to figure out this team's liabilities. On Christmas Day Rockets fans got the gift of nothing at all. There's little point in lingering on this loss, and more than there is a point in lingering on the previous two losses. 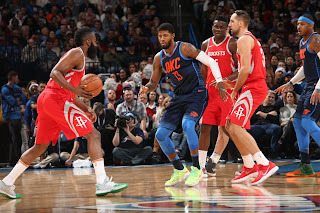 This makes three losses in a row, and three games in which the Rockets couldn't prevent opposing teams from scoring and had trouble with their own offensive flow. Harden and Ariza have been asked to do too much. Eric Gordon, Nene and Ryan Anderson have been under-performing. The Rockets are in a funk, and they need something to change. They won't pay against a frenetic Russell Westbrook every night, but they also lost to both Los Angeles teams immediately before this. The big change they need, which is obvious and also something we learned last time Chris Paul missed time, is that they need Chris Paul back. He gives the Rockets offensive and defensive options they don't have otherwise, and which they badly needed tonight. Equally importantly, he allows James Harden more opportunities to rest, which is important for long-term and short-term success. There were plenty of reasons for the Rockets to be unhappy with that game, but the most important ones are from within. Both teams felt the referees did them no favors, and there were plenty of contentious calls and non-calls. Be that as it may, the Rockets had ample opportunity to steal this game. Between defensive breakdowns, bad passes, and poor shot selection, the Rockets have plenty to pore over. Of course, just because there are identifiable problems doesn't mean there are solutions. There's one glaring note from this game, and it's the most boring note possible. The Rockets have to get healthy. They can't afford to lose one or more all-star caliber talents and still be above the pack. That's a luxury only one team has, and that team won tonight. There's nothing else here, on this holiday night. Enjoy the company of your loved ones, and forget this useless game. There's nothing here.